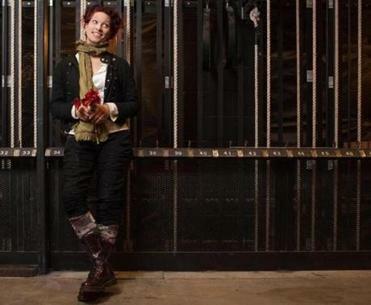 Musician Amanda Palmer’s book, “The Art of Asking: Or How I Learned to Stop Worrying and Let People Help,” begins with a request for a tampon and ends with a hug. In between, we have more than 300 pages of meandering prose that is a curious mix of bleeding honesty and blatant narcissism. Palmer, who began her music career as half of the cabaret duo Dresden Dolls, is a polarizing figure with a coterie of fans who lap up her every tweet and a slew of critics who question her very motives. Her book is sure to confirm the convictions of devotees and detractors alike. The book expands on a TED talk Palmer delivered last year. Also called “The Art of Asking,” the 13-minute presentation was Palmer’s answer to a controversy that arose after she raised a record-breaking $1.2 million on Kickstarter to fund her next album. Public outrage erupted when she then asked musicians to play for free at her concerts. As she says many times in the book, she paid the professional members of her entourage, just not the volunteers. But what can be endearing in a short lecture/performance can be overkill in a book. It’s unclear whether Palmer aims to write a confessional memoir, a self-help book, or a how-to (become a rock star, find feminine hygiene products, or ask your “rich” and “famous” husband for much-needed cash). There are several books in one here, and the finished product struggles to make sense of them and cries out for an organizing principle. As a stylist, Palmer isn’t subtle. She includes several shout-outs to her mother — “HI MOM” — lest her relatives be offended. Her rambling prose screams out phrases like “I am SHAMELESS.” and “SHUT UP.” She jumps from one topic to another, with such deliberately jarring transitions as “You probably don’t know who Edward Ka-Spel is.” She’s also fond of boldface and italics. And sentence fragments. For emphasis, of course. The rock musician raised in Lexington adds “published author” to her growing list of accomplishments. Individually, many of her ideas are compelling, especially the notion that all creative types suffer from an enormous ego countered by an equally large inferiority complex. But the philosophy gets lost in the personal saga, which revels in details that I, for one, would rather not know. The intimate parts of the memoir can be quite touching, however, as when Palmer reveals the times her fan base abused her system of trust. One fan stole her precious red ukulele; another lied about being a victim of an earthquake; and a drunken couple sexually violated her. Here there is no pretense, just disappointment and forgiveness. But Palmer is also full of bravado that rings false. It’s as if she is playing out her battle with what she calls the “Fraud Police,’’ among others, in the pages of her own book. The intimate sections are overshadowed by the screaming bits, and the two don’t ever quite reconcile themselves. At one point, she admits being nervous about writing this book. Her husband assures her, “They’ll get you an editor.” Published reports have said her husband, the celebrated writer Neil Gaiman, cut an astonishing 50,000 words from the original draft. But she still needs another editor to whittle down the text and organize her rapid-fire prose into an organized whole. Don’t forget: It’s OK to ask.